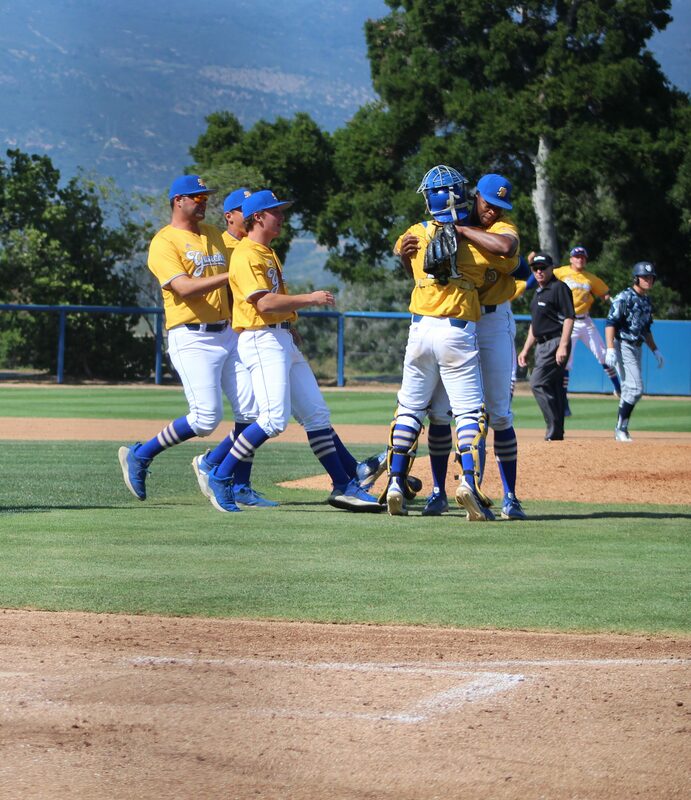 UCSB closer Chris Lincoln embraces catcher Eric Yang after game-winning strikeout. The bases were loaded with Anteaters with two outs in the top of he ninth inning and UCSB clinging to a 3-2 lead, but closer Chris Lincoln was unfazed and unleashed a wicked breaking ball to strike out Mikey Filia and secure the victory. The great escape completed a three-game sweep of No. 15 ranked UC Irvine and served notice to the rest of the Big West and the country that the Gauchos are a force to be reckoned with. Once again it was freshman starting pitcher Rodney Boone battling on the mound and giving UCSB an opportunity to win a hard fought game. Boone surrendered two earned runs in 5 2/3 innings of work with six strikeouts. The UCSB bats were unable to square up UC Irvine starting pitcher Trenton Denholm in the early innings and the onus fell on Boone to keep the game within reach and that’s what he did. UC Irvine leadoff hitter Jake Palmer launched a solo home run over the right field fence in the top of the third inning, giving the Anteaters a 1-0 lead, but Boone responded by retiring the next seven batters in order. Denholm came into the game with a 6-0 record and a 1.53 ERA and was nearly unhittable in the early innings. The location and velocity of his fastball kept the Gauchos off balance until they broke through in the bottom of the fifth inning. Armani Smith sparked the rally with a double to left field and O’Connor McClain drove him in with a triple to the center-field fence that evened the score at 1-1. McClain scored on a single to right field by Kyle Johnson and Jason Willow followed with a triple to the left-center field gap that brought home Johnson and increased the UCSB lead to 3-1. O’Connor McClain and Armani Smith celebrate UCSB’s three-run fifth inning. The Anteaters got one run back in the top of the sixth, cutting their deficit to 3-2 when Brandon Lewis scored on a groundout by Mike Peabody. UCSB reliver Michael McGreavy pitched 2 1/3 scoreless innings setting the stage for Lincoln shut the door in the ninth. However, Lincon walked Christian Koss and surrendered a single to right field to pinch hitter John Jenson to start the inning. Matt Reitano followed with a sac bunt that moved the runners to second and third. Lincoln struck out the next batter Sam Ireland with a series of breaking balls. Palmer was intentionally walked loading the bases for Lincoln’s fantastic finish. “After the sac bunt I just told myself ‘you just have to attack. You have to force them to beat you and not beat yourself,’” Lincoln said. “I broke off seven or eight sliders in a row to finish off those last two guys. With the victory No. 14 UCSB improves to 27-5 overall and 5-1 in Big West play.